On 10 May 1991, the first of three development aircraft for the initial CRJ100 variant performed its first flight from Montréal–Mirabel International Airport, starting a 1,000h flight test program with three prototypes. During the following year, the type was awarded airworthiness certification; on 29 October 1992, initial deliveries to customers occurred later on that year. On 26 July 1993, the first prototype (C-FCRJ) was lost in a spin mishap near the Bombardier test center in Wichita, Kansas. The Bombardier CRJ100 and CRJ200 are a family of jet-propelled regional airliners, based upon the design of the Challenger CL-600 business jet. Roughly, the CL-600 was stretched 5.92 metres (19 feet 5 inches), which was achieved using fuselage plugs fore and aft of the wing, and was matched with the adoption of a reinforced and modified wing, an expanded fuel capacity, improved landing gear to handle the higher weights, and an additional pair of emergency exit doors. 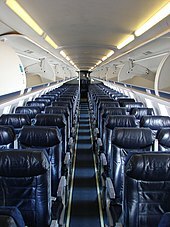 When installed in a typical seating configuration, the CRJ100 would accommodate 50 passengers; while in a maximum configuration, 52 passengers could be accommodated. It was powered by a pair of General Electric CF34-3A1 turbofan engines, each of which was capable of generating up to 41.0 kN (4,180 kgp / 9,220 lbf) of thrust. The CRJ100 featured a Collins-built ProLine 4 avionics suite, including a weather radar. Long range version of CRJ100. 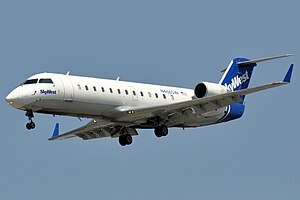 SkyWest Airlines is the largest CRJ100/200 operator. On 22 June 2003, Air France Flight 5672 with registration F-GRJS from Nantes to Brest, France, crashed 2.3 miles short and 0.3 miles to the left of the runway when attempting a landing at Brest's airport. The aircraft's captain was the sole fatality. On 21 November 2004, China Eastern Flight 5210, a Bombardier CRJ-200LR, crashed shortly after takeoff, killing all 53 on board as well as two on the ground. 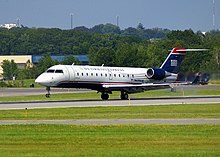 On 19 January 2010, PSA Airlines Canadair CRJ-200, registration N246PS, overran the runway at Yeager Airport, Charleston, West Virginia following an aborted take-off. The aircraft was stopped by the EMAS at the end of the runway, sustaining minor damage to its undercarriage. The information in the referenced article regarding "substantial" damage was premature and inaccurate. The aircraft was flown away within days of the incident after removal of a damaged landing gear cover. ^ "Bombardier – CRJ – 200". AirTeamImages.com. Retrieved 20 November 2014. ^ Andrew Compart (15 April 2013). "Perfect Storm Drives Part-Out Trend". Aviation Week and Space Technology. p. 44–46. Aircraft are retiring younger, but will that last?